World War One. The Western Front. Winter. Duke Lindsay is going to die. He knows it’s only a matter of time. The war that was supposed to be the adventure of a lifetime has turned into a terrifying nightmare that has crushed his once carefree spirit. With no family to care what becomes of him, and all his friends dead, he has nothing to live for. Until Corporal Driscoll comes along. Driscoll forces Duke to obey him, to be a man, to stay alive. As they undergo hardship and fight bitter battles side by side, Duke comes to realise Driscoll cares for him in a way no one ever has before. With Driscoll’s help, Duke finds in himself the man he was always supposed to be. From the ashes of war, an enduring friendship begins to blossom. 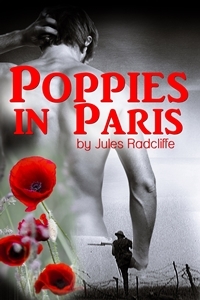 Poppies in Paris, available from Amazon and eXcessica now.